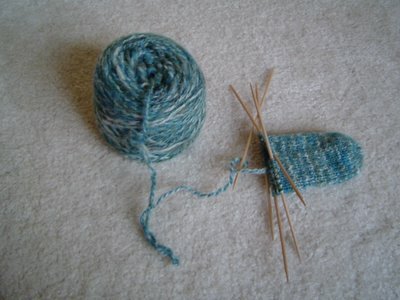 Yesterday, after mentioning the new sock project that I started even though I should have been working on (insert name of Christmas gift that's not getting knitted very fast here), I got some questions in the comments about knitting a sock from the toe up. I figured that answering these questions is more interesting that me discussing things that cannot be discussed, or the Gifts That Will Not Be Named, if you will. So here goes. A long time ago, in a galaxy far, far away, (actually it was Texas, but sometimes Texas seems like a different galaxy) I stumbled across a toe up sock pattern here. I had never tried knitting a sock before but these seemed fairly easy and since they were toe up, there was no kitchener stitch (I really don't do kitchener stitch well, or even OK, in fact I stink at kitchener). Plus, since they are little footie socks, once you're past the heel turn, you're pretty much done, so it completely appealed to my short attention span. So I knitted a bunch of these. In fact, I taught myself to do Fair Isle knitting on them. For those interested, I used Dale of Norway Baby Ull on these. Then I started doing full socks, with actual cuffs. I threw in some ribbing and some knit/purl stitch patterns and I was happy. 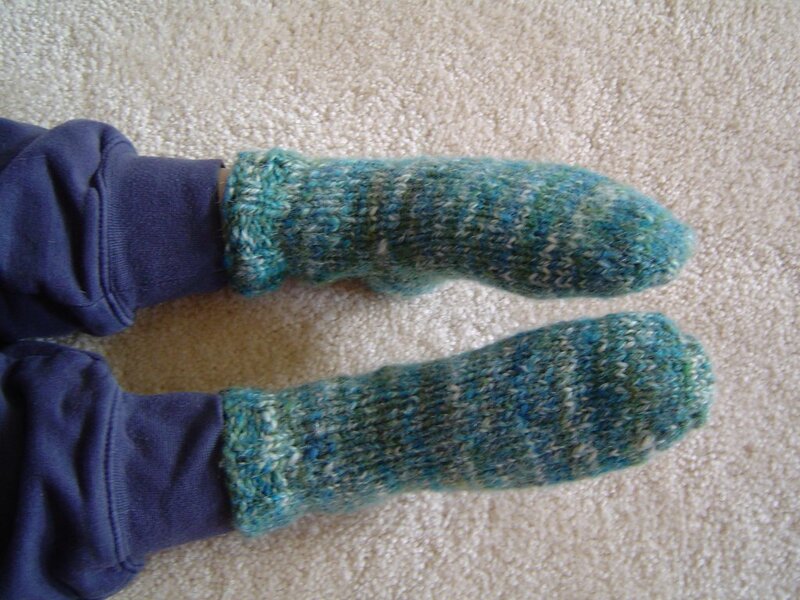 For a pattern I used a combination of what I had learned with the footies and Wendy's Basic Toe Up Sock pattern. To start the toe I use a provisional cast on and the Easy Toe, discussed in this Knitty article. I've found that with the exception of one pair of socks, if I start the heel turn when the sock comes up the top of my foot to where my ankle bends into my leg, the socks are exactly the right length. The one pair of socks that was the exception was the Loganberry Socks and that yarn (handspun Border Leicester and Mohair) does not have a lot of elasticity, so I had to knit farther than where my ankle meets my foot for the sock to fit correctly. 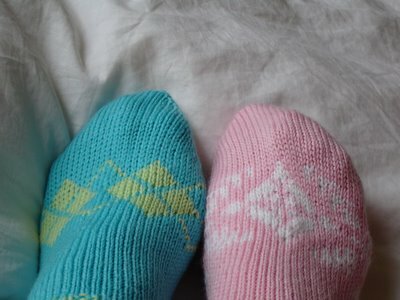 I love knitting toe up socks because for me, they are very intuitive and I don't have to think about them much at this point. I'd like to learn how to knit from the cuff down because there are some really great sock patterns out there that I'm too lazy to reverse, and I think it would be good for me to know how to do this. I can see myself knitting toe up though with handspun since I don't add much in stitch pattern to a handspun yarn anyway. 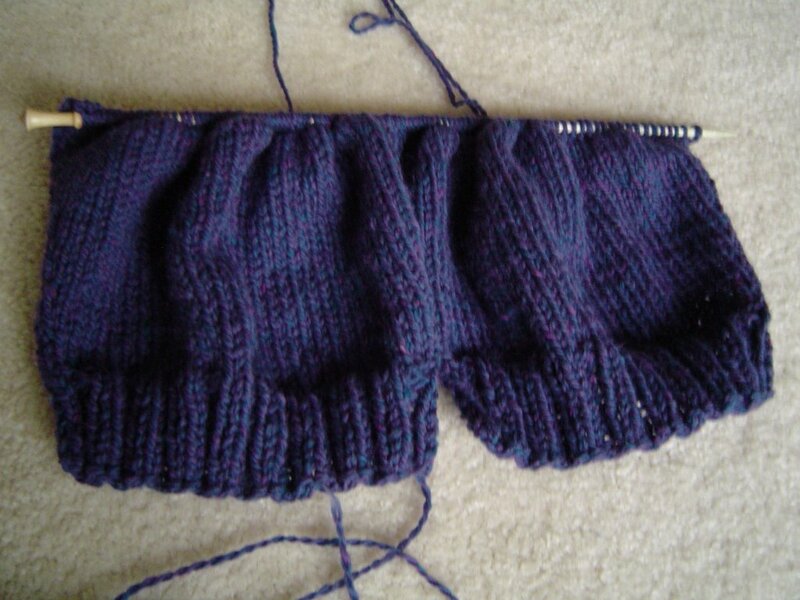 We'll have to see if I can do this first pair of top down socks before I decide if I'm doing any more this direction! 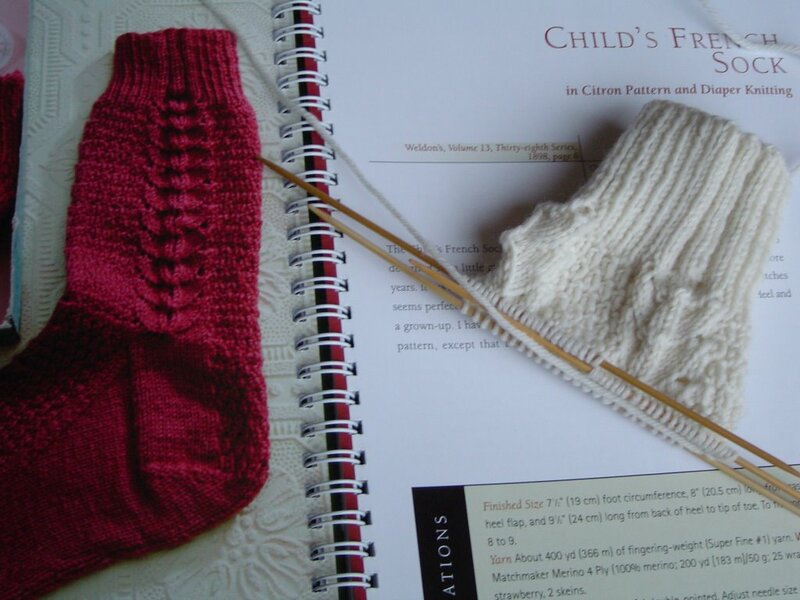 These are the Child's French Sock from Knitting Vintage Socks by Nancy Bush, and despite the name, they are sized for a woman's foot. I think this is such a pretty sock! I'm knitting it in the undyed sock yarn from KnitPicks because I realized that my attempt to purge my sock drawer of all store bought socks would never work if I didn't have a couple of white socks. Those of you that have been wading through my endless drivel for a while, I mean, longtime blog readers, will notice that something crazy is going on here. Not only am I being a sock slacker, I'm knitting these from the top down! I've never knit a sock this direction. I'll tell you right now that a top down heel turn scares me. I plan to give it a try because so far the directions have been very thorough and I know that there are a lot of things that make sense when you have yarn and needles in your hand but won't make a bit of sense if you're reading with empty hands (try explaining how to make a knit stitch to someone who isn't holding yarn and needles if you don't believe me). If it doesn't work, I plan to cop out and do my standard short row heel turn because theoretically, it should work either way. Or so I think. Stay tuned - these might be really fancy hand warmers! Happy Thanksgiving! 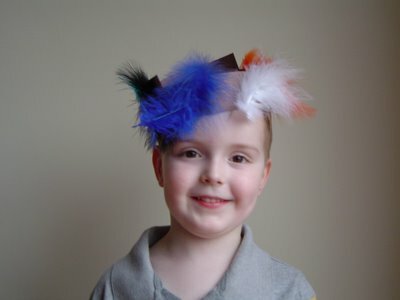 Don't you just love those preschool projects? I've been spinning a little bit on the Harvest Roving from Linden Lane Farm. This is Romney and Mohair and the colors are just gorgeous. It is cranberry, pumpkin, leaf green, and a pale blue green which all spin together in the perfect yarn for this time of year. I'll do myself some socks and Caleb has decided he wants socks from it too. As you can see, I've gotten a little spinning buddy. This is one of the Fisher Price Little People sheep (we have a couple of them running around here). Caleb gave her to me, and for the most part is leaving her on the wheel. I've got a lot of cooking to do today for Thanksgiving tomorrow but I hope to get some spinning done while I am waiting for things to bake. Pumpkin pies always take twice as long to cook for me as they do for my mom - no clue why that is! It's Done! 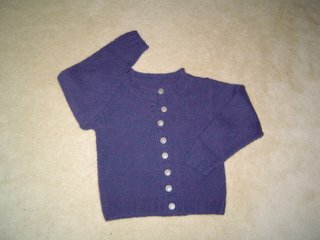 I finished it Sunday, then washed and blocked it before sewing on the buttons yesterday. I really like the way it fits and its so comfortable to wear, even though I've only tried it on over pajamas so far. Sorry about the bad picture - its raining here and I had to use flash to get anything more than a dark sweater shaped blob. I plan to wear it today, and maybe the rest of the week. We are supposed to get snow here tomorrow night, and possibly Thursday. According to people who have lived here all their lives, it usually doesn't snow until January so this is pretty exciting. Well, whether it snows or not, I'll be ready in my snuggly Everyday Cardi. What are these? These are the parts to the world's ugliest tensioned lazy kate. I have been talking to a lady named Fulvia about my spinning wheel. She's fixing to buy a Rose and wanted to see how I liked mine. I mentioned that I had figured out a way to make the bobbin carrying box a tensioned lazy kate, but of course, this is a hard thing to describe in words, so here's a picture. What you see above is the bobbin carrying box that came with my wheel (see the matching rose on it?) 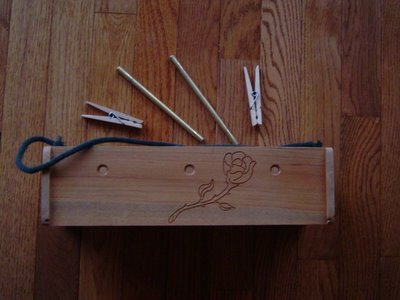 It had been drilled with holes to fit the metal dowels you see above the box. It also had the handle, which is a stretchy piece of cotton rope. Also, I use two highly technical clamping devices, AKA clothespins. What you see below is how it looks when I'm using it. I'm ready to start plying the Rendezvous at Dusk, so I've put the bobbins into the bobbin box, but in order to keep the bobbins from backspinning while I'm plying, I've clamped the handle gently across the tops of the bobbins (I clamp it harder when the singles is thicker). This doesn't look like much and it isn't at all fancy, but the tensioned lazy kate for the Majacraft is around $80 if I remember right. A setup similar to this could probably be made easily with some dowels, a sturdy shoebox, clothespins and a stretchy string or piece of yarn. Then you can spend your money on the fun stuff like rovings or fleece! Never thought you'd see this on Pink Lemon Twist did ya? I really do not care for orange. I do not like it in a boat, I do not like it with a goat. I do not like it in a house, I do not like it with a mouse, I do not like it Sam I Am, OK, you get the point. So why are 6+ ounces of orange Kitchen Sink Batts sitting in my house? Well I'll tell you. Last weekend we took Caleb to see Chicken Little and in that movie (this won't spoil it for you if you haven't seen it) there is a little orange alien. He's fluffy and orange with orange and red striped legs. I had the same kind of response to the alien that I do to Angora Rabbits, which is to say that I wanted to hug him and squeeze him and just love all over him and possibly talk stupid baby talk to him, but I would never admit that publicly on the Internet - that would just be sad. Anyway, as soon as I saw him, I thought, "He should be socks." Not that I would harm the fluffy little alien, although being a spinner I did wonder what the crimp in his coat was like and if he needed shearing once a year and do you realize that if these aliens were real and not animated we could get fluff to spin that wouldn't need dying? (They came in other colors too.) But I digress. Anyway, I thought SOCKS and all afternoon I kept thinking SOCKS. Well, it just so happens that Kary (Kitchen Sink Batt Kary) had done some orange batts she named the Wild Haired Fairy Wonder. 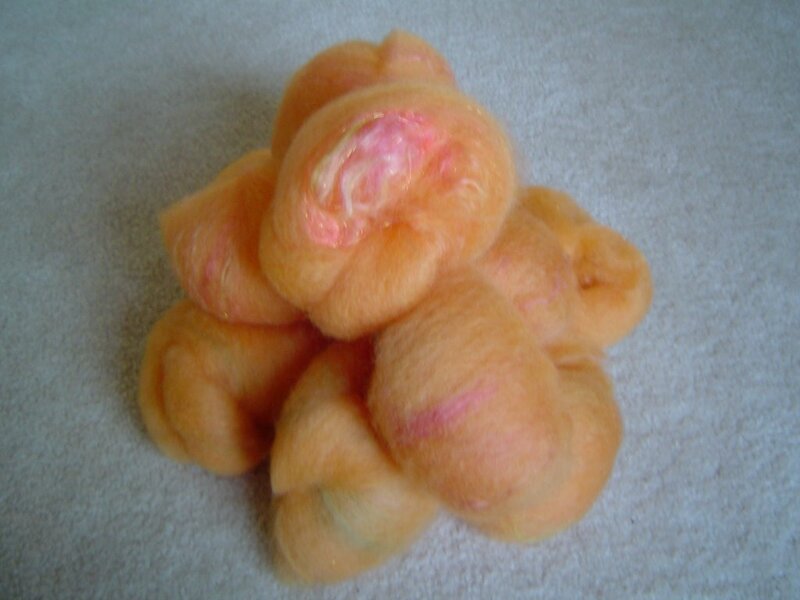 They were orange with streaks of pinky red silk in them and watermelon colored Angelina (really cool sparkly stuff for you non spinners). I had seen these batts and for some reason they spoke to me. They were orange so I ignored them. They kept speaking to me. I ignored them. Kary did the Out Of This World batts (gorgeous pale blue with bits of sari silk in them) which are so much more me, but I was obsessing over the Wild Haired Fairy Wonder. I tried to ignore this obsession. I kept doing the day to day things that must be done, as far as the world knew I had it together, there was no problem. Inside though, I was jonesing for a hit of Wild Haired Fairy Wonder. Finally, after seeing the alien, I had the excuse I needed, so last Saturday night, after we got home, I contacted my dealer, I mean Kary, and got the batts. They arrived yesterday. They are wonderful. They will be socks and I will find some bright pinky red something or other to add stripes to the cuffs. I will have little orange alien socks someday. In other, more sane news (at least as sane as it gets around here), Carrie of the comments yesterday asked a question about how I had changed the shaping on the sleeves of the Everyday Cardi (I had mentioned that I'd modified them, but not how I'd done it). I modified the whole sweater from a drop shoulder style to a modified drop shoulder style (Ann Budd's Knitter's Handy Guide to Sweater Patterns has designs for this style). But Carrie said she was already knitting on the fronts or backs or somewhere on the body, so its probably too late to adapt the body of the sweater. The sleeves can still be adapted though. After finding a number of references to the "batwing" shape of the patterns sleeves, I looked at what the pattern called for. I'm making the smallest size which is 40 inches around the bust (this is supposed to be an oversized, comfy cardigan). The sleeve directions call for an 8 inch cuff in my size, increasing to a 18 inch sleeve top. I decided that 18 inches at the top of the sleeve would probably look good with the sizing of the overall sweater but the cuff just seemed a little small. This is afterall a cardigan and will be worn over another shirt, so a larger cuff is probably a good idea. I decided to cast on enough stitches for a 10 inch cuff (remember of course that I can let the ribbing pull that in or block it out, whatever looks best - haven't made up my mind), and then increase as the pattern directed to 18 inches at the top of the sleeve. I'm happy with the shape of the unblocked sleeve, it doesn't seem too floppy at the top and I think it should be comfortable to wear. I'm more than halfway done with the back of the sweater and hope to get the whole thing done towards the first of next week. We'll see if that works. 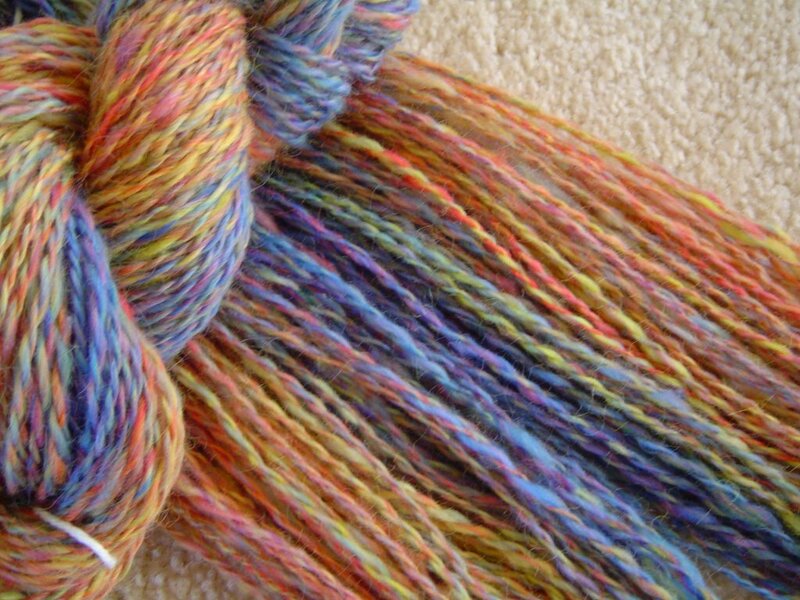 Last night I plied the rainbow colored singles that I spun over the weekend. I'm really happy with the way they came out and you can see that I kept the warm colors and the cool colors generally separated - they blend together with some greener tones. When I look at them, I keep singing Rainbow Connection from Kermit the Frog. I have 5 ounces total and I'm not sure what I'll do with them at this point. 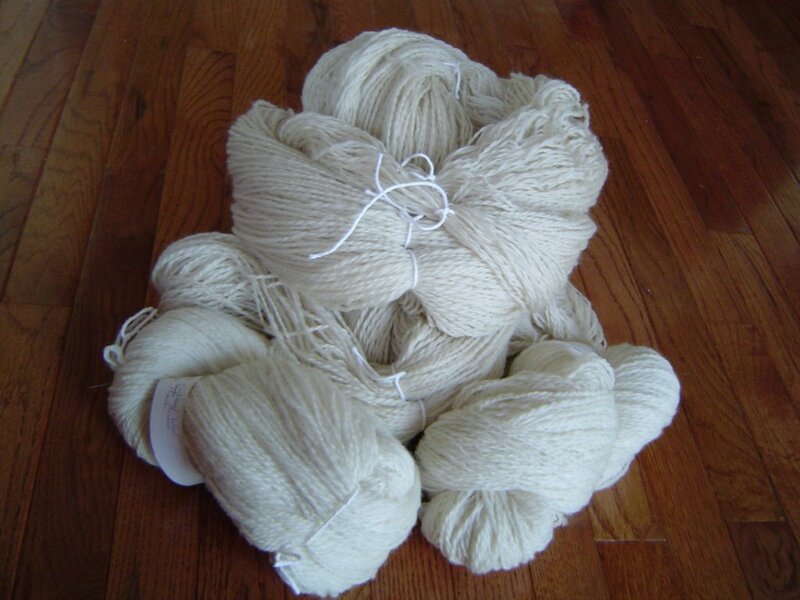 The fiber is a Columbia lamb's wool and its so soft, with a little bit of shine to it. I had originally thought of doing a pair of fingerless mitts for myself, but I have enough to do a pair of socks, but they don't have any mohair in them and I'm afraid I might wear them out too fast. I know that whatever I do I will be amused by the colors changing constantly. I'm fascinated by just looking at the skeins of yarn, but then we've already discussed that I'm easily amused. Yesterday I took the word verification thing off the comments because my Mom had mentioned that she hadn't been able to comment since I put it on and I had noticed that there was a decline in the number of commenters. Well, wouldn't you know it, I got spammed. Twice. I think I'll wait and see what happens, but I might have to start moderating comments. I don't know. Right now I don't even want to think about it. Caleb got sick over the weekend and while he bounced back quickly, he shared the germs so now I'm sick. Nothing like trying to sleep when your sinuses are so full your entire face hurts. Add the cat serenading me for no apparent reason at 12:30 and again at 3:15 (that's when I got out the water bottle) and it was a fun night. There has been some knitting here at the Pink Lemon Twist. I finished the sleeves to the Everyday Cardigan (with a Twist). As you can see from the one above, they will definitely need a good blocking. The neat thing about Peace Fleece is that when it gets washed it softens up and the mohair blooms which makes the whole thing look softer and the stitches even look less crisp. I saw this on my Sacrifice to Gauge, I mean gauge swatch, and I understand that this softening and blurring continue with wear. I can't wait to see what it does for myself. The temperature is supposed to drop sharply here later today and I wish I was farther along on this sweater since it sounds like we're going to have perfect sweater weather. Even if I had finished the fronts and back (which I haven't even cast on for yet) I haven't decided on buttons yet so I guess I better get going. In spinning news, I'm still spinning on the second half of the Kitchen Sink Batt, but I hope to finish that today. After finishing the mass of white Falkland, I had to do something with color. This is what I did this weekend. 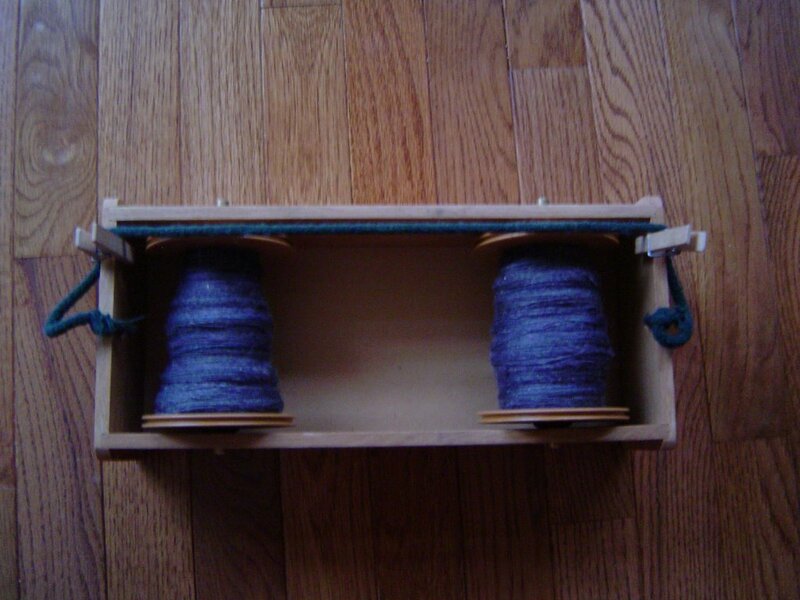 On the right are two bobbins of 5+ ounces total of a rainbow dyed Columbia lamb's wool. I sorted it out into warm and cool colors and then spun it roughly in rainbow order, hoping that when I ply it, I can get a general blending of color. On the left is 2+ ounces of Rendezvous At Dusk, half of a Kitchen Sink Batt. It is kind of an overall smokey violet but there is silk in it that is all different colors of green, blues and other purples, plus there is some gold Angelina in it - just for a little sparkle. I'm spinning this laceweight and the other I did in my heavier weight of spinning. I've started on the second half of the Kitchen Sink Batt and once it's spun I'll ply the Columbia. It was so much fun spinning something that wasn't white! Some big things have been happening around here. 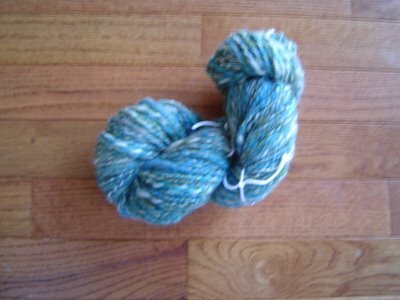 First, I finally finished spinning the Falkland Top. You can see it all above. All 29 ounces of it, or 1774 yards of two ply. I've got to wash it all out and set the twist, but the spinning part of it is done. I can't believe that I spun this much of one thing. This is enough for a sweater plus something else. 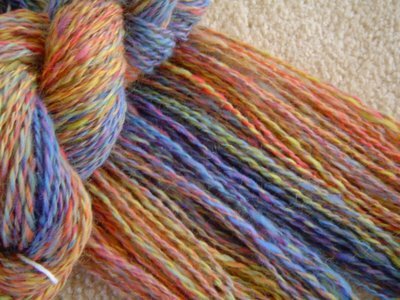 Of course now I have some really brightly colored wool on the wheel and there are only 5 ounces of it so that should go pretty fast. I'll probably spin some smaller bunches of fiber for a bit just to recover from spinning all this. OK, the other Big Thing happening here is that yesterday I found out that my Sister in Law's Sister is pregnant! I'm going to be an aunt! (Yes, technically I'm not really in a position to be this baby's aunt, but tough, they're getting me whether they like it or not.) Want to know the fun part? Twins and triplets run in that family. Woo Hoo! Congratulations Eric and Dalese! Finally, Christine sent me some more ideas for Gift Giving Friday. Thanks Christine! So, in keeping with the big honking pile of yarn you see above, today's gift idea is handspun yarn. This could be a gift for a knitter or crocheter obviously, but you could also spin some very fine yarn and give it to an embroiderer. It wouldn't even take much yarn to amuse someone who does hand needlework, can you just imagine a very finely spun silk? How wonderful would that be? 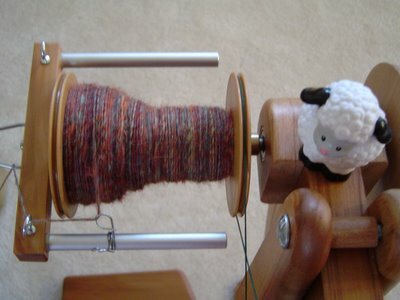 You'd have to be very careful keeping your spinning fine and even and consistant, but it could be used for virtually any of the needle arts. The other day a wonderful thing appeared in my mailbox. It was a package from Carol at the Silkworker. Inside were two wonderful hanks of Tussah Silk Top that she had handdyed. This is Aristocrat. It has reds all the way from flame red to red violet with everything in between plus some purples and a few blues. I imagine it will spin up as kind of a red violet color overall. 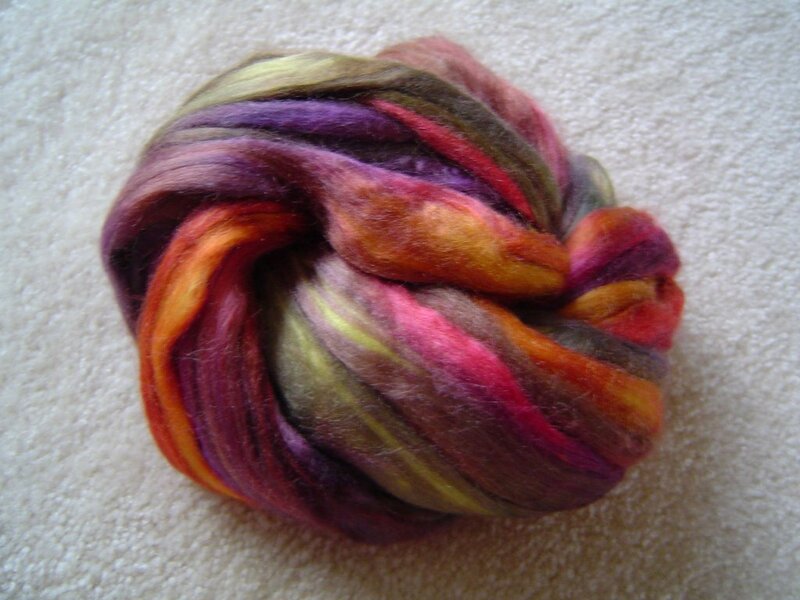 The other colorway I got is Calliope. This one has so many colors I don't really know where to start. It has bright pinks, oranges, a few yellows, some greens, blues and purples and they all look like they are sitting on a grey background which totally makes the other colors pop. I have been hearing about Carol's silks on the Spindler's list for a while, but had so far not given into the temptation (even if you don't spin you should at least go check out her site and look at the gorgeousness). I think I understand now why so many people are addicted. This could really be a problem. If anyone sees me standing by the interstate with a sign that says "Will Work for Silk" you'll understand. Won't you? These are sleeves. They are not large matching triangular gauge swatches. I have learned my lesson and will no longer skip this all important part of knitting (at least until I feel like Gauge has gone off to bother other knitters, then I'll do sleeve swatches again. HA HA!) These are the sleeves for the Everyday Cardi, but I've made some modifications to the original pattern. After Googling the pattern name, I found that there were several critiques of the pattern: the sleeves were too narrow at the bottom for the width at the top (batwing sleeves) and the ribbing wouldn't come out so you could seam it invisibly with the original numbers in the pattern. So, I decided to tweak the pattern a bit. I changed the sleeves so they were wider at the cuff (it's a cardigan, so I want them to be a bit bigger anyway) and instead of just making them a drop shoulder style, I changed the sweater to a modified drop shoulder. This will get rid of some of the bulk in the underarm area but shouldn't mess with the oversized fit. I also adjusted the numbers a bit so that the K2, P2 rib would seam invisibly. For those of you that have never done this I'll explain how it works. As written, the pattern has you cast on in multiples of 4. K2, P2 rib is a pattern with a multiple of 4 so this seems logical. When you sew your side seams (and sleeve seams) you will have a K1, sewn next to a P1 at the seam, so the rib doesn't look continuous. If you add or subtract 2 stitches (now your number is a multiple of 4+2), you can work the rib K2, P2, ending with a K2. This way, when you sew your seams, you will have a K2 straddling the seam (the other K2's are the seam allowance) and anyone who has ever tried to sew a sweater together knows its easier to stitch between two knit stitches than it is to stitch between a K and a P. This is also why I always do my increases and decreases 2 stitches in from the edge - my edge stitches are normal stitches and I know exactly how they are supposed to look which makes seaming faster and neater looking. Just my little way of being obsessive compulsive about my knitting. Once upon a time, on the great Mt. Fiberous (just to the left of Mt. Olympus) there was a Knitting Goddess. She oversaw knitting of all kinds, giving perfectly even stitches to those who honored her, and knotting up the skeins of those who didn't. She was bored one day and decided to walk down to the village at the base of the mountain. There, she came upon an engineer (the exact math kind, not the train kind). He looked a lot like Matthew McConaughey, had a voice like Sean Connery and wore a kilt. Yeah, he was hot. The Knitting Goddess thought so too and eventually they had a son (this is the G rated version, you don't want to know what the other version involves). They named this son Gauge. Now Gauge wasn't quite mortal, but he didn't have all of his mother's powers either. He did have powers of math (wouldn't those have been handy in Pre Calculus?) and an eye for precise design. He also had a huge ego. Gauge quickly learned that most knitters ignored him and paid homage only to his mother. This was very upsetting to him. He realized that with his limited powers, he couldn't thwart all of the knitters all the time, but he could strike randomly and without warning and wreak far more damage. Now, since Gauge is partly mortal, he can be defeated by the particularly observant knitter. 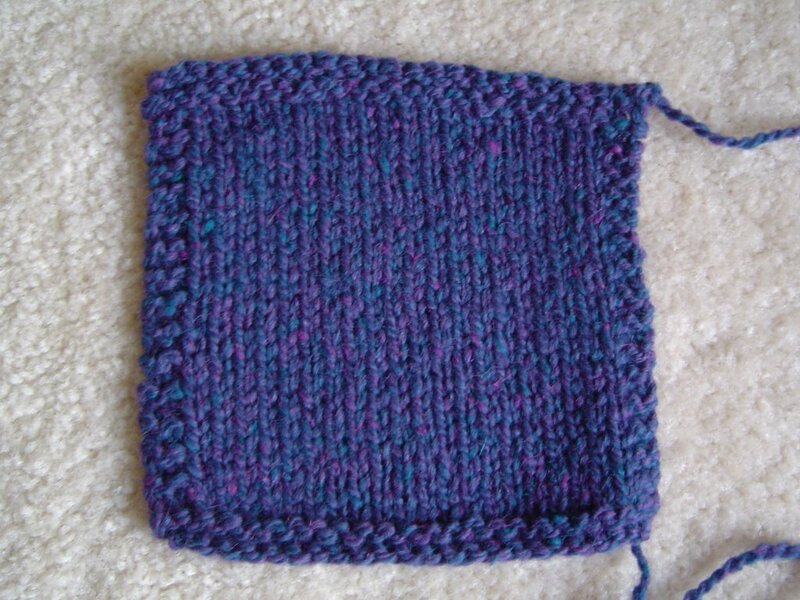 The knitting of a Gauge Swatch is the most common offering to salve his ego and deflect his wrath. He has a small following who run around saying things like, "Take time to save time, check Gauge," but many knitters ignore these fanatics, knowing that the odds are in their favor and Gauge can't get them every time. When Gauge does strike, he is swift and merciless. This weekend, I was a victim of Gauge's wrath. 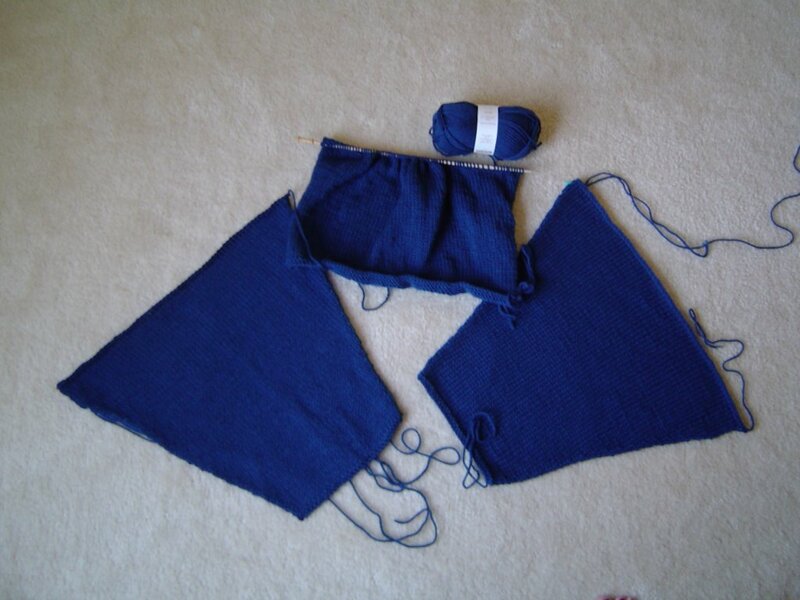 Above, you see the two finished sleeves and partial back of Caleb's navy blue sweater. As I was knitting the back, I realized that it looked a little large. Now, this is a Debbie Bliss pattern and anyone who has knitted a child's pattern by Debbie Bliss can verify that Ms. Bliss is a huge fan of "growing room." I had heard this before and had chalked the immensity of the sweater up to growing room. Saturday, as I was working on it, I wondered, "Hmm, I wonder what my gauge is?" Well, let me tell you guys, it wasn't pretty. I was supposed to be knitting at 4 1/2 stitches per inch. The knitting coming off of my needles was 4 stitches per inch. This meant the sweater would be 40 inches around at the chest. Caleb is not yet 5. His chest measurement is in the low 20 inches. My downfall? I usually knit the sleeves first as a sleeve shaped gauge swatch. This only works however IF YOU ACTUALLY CHECK THE GAUGE OF THE SLEEVES AS YOU KNIT THEM. 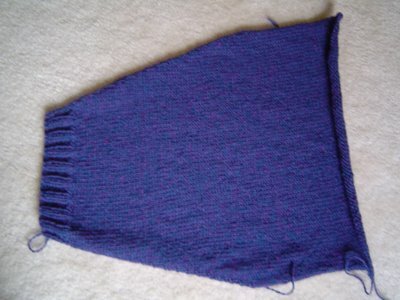 You shouldn't just happily knit away, never going near a ruler during the entire sleeve experience and then start the back of the sweater and still not check to see what your gauge is. This is really just asking to be smote by the wrath of Gauge. I frogged the sweater and have put it away for a little while (everytime I look at the yarn I think, "Oh Crap" and I refuse to knit my son an Oh Crap Pullover). By the way, Gauge, I did this just for you. See the pretty garter stitch border? I even blocked it nicely and remeasured. Please go away now. Thank you. By the way...big news around here at the Pink Lemon Twist! Remember the couple of weeks back in September when I dragged you guys through some of the projects I've made before I started the blog? Well I was knitting a submission for Knitty at the time. This morning I got an email and I'm in! Big Woo Hoo! The Winter 2005 edition is supposed to be up around December 1. I'm not sure what kind of details I can give out at this point, but I can tell you the pattern is not for a stole or a shawl. I'll be sure to link to the pattern once the issue is up, but you'll probably see the confetti and balloons and hear all the ruckus two or three blogs away when that happens. 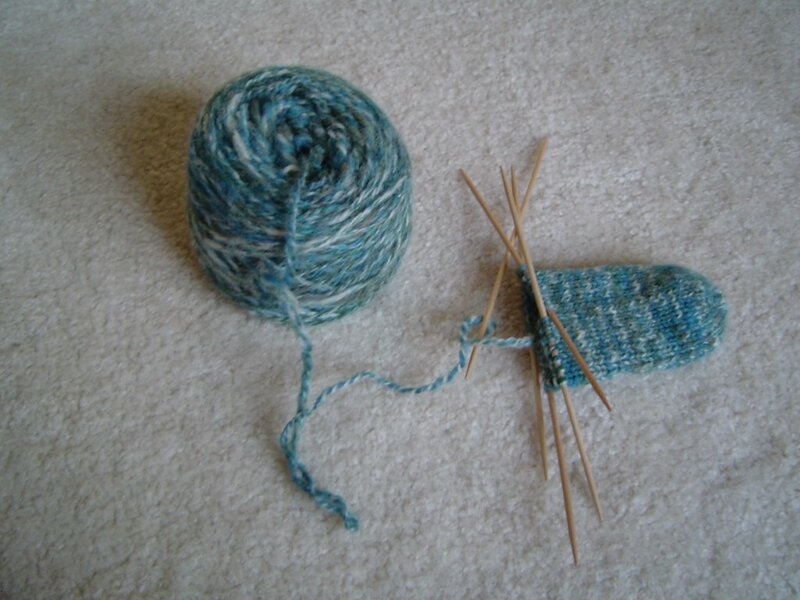 I've started on Caleb's first sock. (He actually does have socks, its not like he's been running around barefoot for 4 1/2 years, he even has handknit wool socks, these are just the first pair I've knit for him.) A freaky thing happened with the yarn. 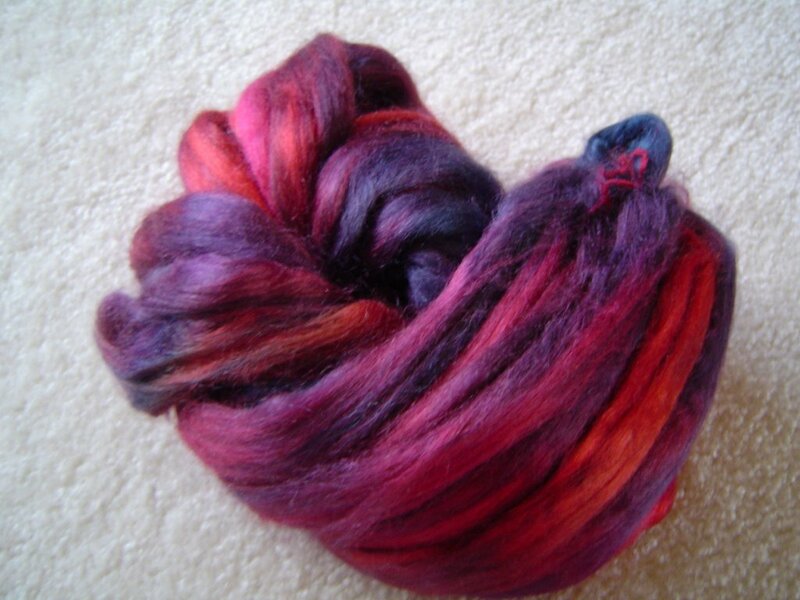 I didn't spin it thick, I spun it at my non-lace weight. 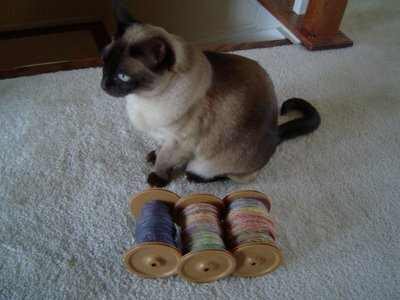 Yes, I have two weights for spinning: lace weight and non-lace weight, which is bigger. Why yes, I am a highly technical spinner who checks her Wraps Per Inch religiously and loves nothing more than spinning an entire bobbin with an Angle of Twist variance of no more than 3 degrees. OK, I'm a seat of the pants spinner and I spun these singles in the thicker weight that's comfortable for me. Here's where it gets weird. Once I plyed and washed the yarn, it puffed up - not a slight puffing that would just make the yarn look more finished, no we're talking Peeps in the Microwave* kind of puffing: freaky and dangerous. I'm knitting these on US 3's/ 3.25mm needles and I'm getting (are you sitting down?) 5 stitches per inch! Isn't there some sort of Knitting Law that prohibits this kind of activity? How am I knitting with such small needles and getting such a huge gauge? Its not like I'm knitting them so tightly that my hands are in pain. This yarn is very comfortable knitting on these needles. Why are there only 5 spi? Worsted weight knitting doesn't happen on US 3's people! My only explanation is that the same forces in the universe that can let you knit 374 rows of a sweater and have the exact same measurement as when you started are at work here. Want to know the cool part? In a sock for a 4 1/2 year old foot, at 5 spi, there are only 28 stitches around. The picture above is about 10 minutes worth of knitting. I should have these done by lunchtime. *I have spent the last 20 minutes Googling for a picture of Dueling Peeps to link to here and I've had no luck at all. Sorry, no Dueling Peeps today. This is a surprisingly simple yet beautiful lace pattern. All four sides of the stole have shaped edges. In black it is the perfect partner for your little black dress, but it would be beautiful in any color. The finished stole measures 29 inches wide by 70 inches long but directions are given for adjusting the size for the wearer or yarn differences. This design is a simple but elegant style that can go anywhere. 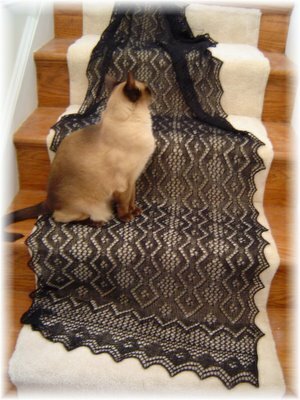 Complete directions with detail photos and design charts are included in the pattern.